This crepe Rag & Bone jacket features fold-over lapels and a hook-and-eye closure. Welt hip pockets. Vent at back and light padding at shoulders. Single-button cuffs at long sleeves. I'm so in love with my new blazer. I got the blue one, it's more like turquoise. I really like the color! The tailoring is impeccable. I'm 5'3.5, 94lb... It's a little bit big at the waist, other than that, it fits perfectly. Can't wait to wear it!! 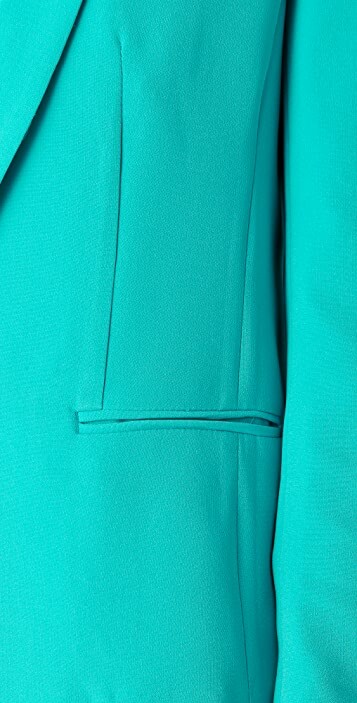 This blazer is so beautiful in person...I love the color of the jacket and the lining (I ordered the blue). The fit is amazing, I'm 5'5/ 105 lbs and ordered size 0. Great purchase! Rag and bone makes true quality clothing and this blazer does not dissapoint. The fit is impeccable . I do wish that the back of the blazer had a lining thus the 1 less star. Not too see through though. As for fit the 0 worked for me. 112 5 3"
Great tailoring, but sheer in back. I loved the fit of this blazer. I'm 5'6", 135 lbs, and the size 2 fit perfectly. The tailoring was impeccable, and the blazer cute. However, I'm returning the item because it isn't lined and you can see everything through the back of the blazer. You can see the seams, the outlines and underpinnings of the shoulder pads and the pattern of my top underneath. It cheapens the look. For $495 I expect more. Got it in white and it is great! Don't really like it of the material, usually wear natural materials. But the design and fit is perfect! I purchased the blazer in Ivory and I love it. The fit is perfect. (I am 5'2, 100 pounds and the size 0 fits me perfectly). I tried the bop basics blazers, but I preferred the cut and quality of this blazer. The sleeves have a beautiful blue and white striped lining so you can vary how you style the jacket by cuffing the sleeves. I love the fit, it's so classy. I returned this blazer for two reasons: the sleeves on this one were really hard to roll up and the color is so different from the pics. It's totally the same color as my Rebecca Minkoff Becky jacket in turquoise.